Trailheads at Clint Dempsey Soccer Complex (600 E. Pilar St.), Liberty Hall (805 E. Main St.) and Jimmy Hinds Park on E. Austin St. 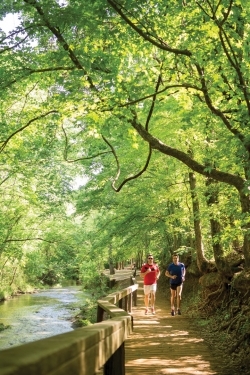 Experience the beauty of Lanana Creek from south of downtown to the north loop. Originally a Native American footpath, this trail extends for 6.9 miles through cottonwood and oak dominated forests, past Father Margil’s Spring, through the SFA Mast Arboretum, to wide open floodplain prairies in the northern part of town. Click to go to the trails map provided by Healthy Nacogdoches Coalition.